Will the Trump administration make gold great again? 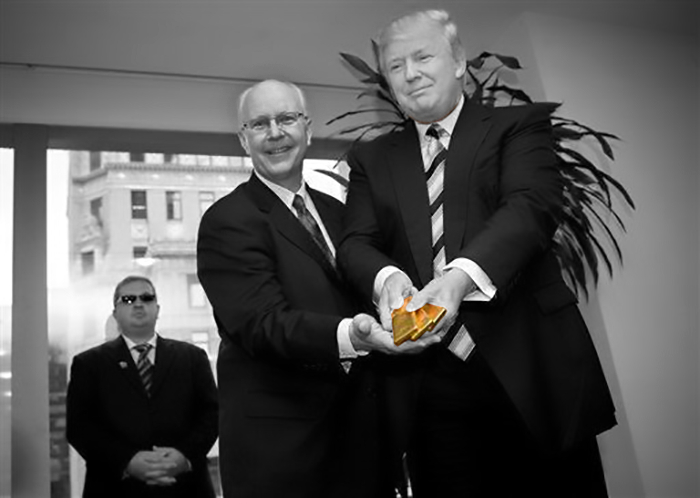 Donald Trump has been interested in gold for decades and once reportedly accepted rent payment in gold bars when APMEX was opening a New York branch back in 2011 (see photo above, or scroll down for video). He also bought a large quantity of gold for about $185 an ounce when gold ownership was legalized in 1975, and sold at just under $800 an ounce years later. Prior to his election on November 8, 2016, most gold experts predicted a sharp rise in the price of gold and a big decline in stocks if he were elected, mainly because of all the uncertainty surrounding his possible economic policies, including the potential for a trade war if he were to follow through with his suggestions for import tariffs (the border adjustment tax). Sure enough, as soon as he won late on the night of the 8th, spot gold prices rallied over $80 while Dow futures dropped 800 points. The gold rally was short-lived, and the experts turned out to be wrong, at least for a while. Gold began declining from that time, hitting a low in mid-December of $1,128, when it began rising again—as it has mostly done since then, now up around $100 compared the start of the year (or about $120 compared to the December low). It should be noted that gold hit its all-time nominal high of $1,923 in September 2011, not long after a deal in Congress to raise the debt level after the ceiling was temporarily breached, which resulted in a downgrading of the U.S. credit rating by one of the major rating agencies. Not to mention that the temporary default in 2011 added $1.3 billion to the cost of servicing the debt just that year, and much more over time. Regarding inflation, which had remained low in recent years, former Federal Reserve chairman Alan Greenspan said recently that the risk of inflation is starting to rise because an unemployment rate below 5% has put upward pressure on wages, which did start rising in 2016, and unit costs in general. Rising interest rates are associated in some people’s minds with lower gold prices, but what really matters is not nominal rates but the real rate after factoring in inflation, which has been falling even with the 25-basis-point rate increase last December. They would still be negative if, as widely expected, rates were increased in March by a similar amount. In such an environment, gold is a useful asset to own since there is not the usual opportunity cost of owning it compared to bonds and cash that pay dividends when real rates are positive. It is true the Fed has indicated it may raise rates three times over the course of 2017, provided economic growth picks up and is not derailed by import tariffs or other disruptive factors, which would also push inflation up since the cost of the tariffs is ultimately paid by consumers in the form of higher prices. But depending on how much inflation actually picks up, the planned rate increases will probably not be able to hold inflation back because of time lags, which typically run six to nine months from the time rates are increased until they have an impact. The other key factor, which remains a wild card for the moment, is how the economic policies of the Trump administration will impact the levels of the federal debt and deficit over the coming years. It is certainly possible that growth will pick up, as President Trump has suggested, but his aggressive and expansionary economic approach is widely expected to raise federal government spending by a very large amount between the infrastructure plan, the planned boost in military spending, and pledges not to cut entitlements. And that will be coupled with large planned tax cuts, which will reduce federal revenue. Not to mention the cost of the border wall and the planned repeal and replacement of Obamacare, which is also likely to be very expensive, according to the nonpartisan Congressional Budget Office. It is true that higher growth would boost tax revenues and that there are plans to slash spending in other areas, but those factors are unlikely to be enough to offset all that increased spending—especially since economists believe that substantially higher growth would require either a larger population or higher productivity rates, which have been lagging in recent years, and that the programs being cut amount to a very small percentage of the budget. With the debt already close to $20 trillion (having doubled in the past decade) and interest rates rising, the cost of simply servicing the debt could soon reach levels that would force severe cuts in all other government spending and entitlements, especially if the planned tax cuts and infrastructure programs further ballooned the debt by trillions more as expected. The nonpartisan Tax Foundation estimates that even with higher growth, Trump’s tax plan would add between $2.6 and $3.9 trillion to the debt, and the real amount could be double or more those amounts, if optimistic growth projections do not work out. As of the time of writing, President Trump has not yet set forth any specific policy proposals in the form of legislation to be taken up by Congress, and only a few details of the proposed budget blueprint have trickled out. So it remains to be seen what actually happens given all the unknown variables. But for the reasons discussed above, there is a rather broad consensus among gold watchers that spot levels in 2017 should reach at least $1,300–$1,350. Some, such as Mr. Nichols and Mr. Stuppler, see it going much higher, perhaps even reaching or surpassing the level last seen in 2011—especially if there is another debt-ceiling crisis or a substantial increase in the federal debt and deficit and in inflation. Low gold prices between 2012 and 2015 forced many gold-mining companies to cut back on production and close mines, which has helped to curtail supply. Demand for gold rose 2% in 2016 and hit a three-year high, according to the World Gold Council. Gold accumulation by China, the world’s central banks, institutional investors, and individual buyers, especially in Asia, has increased. Recent changes to Sharia law that make it legal for Muslims to invest in physical gold. Increased uncertainty comes not only from the U.S. but also from many global factors, such as increased geopolitical concerns (North Korea’s missile program and other issues) and conditions in Europe, including how Brexit will be implemented and the upcoming elections in France, Germany, and the Netherlands, each of which has populist politicians running for office. * See my article, “Gold in 2016 and Beyond,” COINage, February 2017, pages 10–15. ** See my Coin Update article, “The New Case for Gold and the Gold Standard,” December 7, 2016. This post was corrected on March 8, 2017. Original text in the eighth paragraph referenced an “all-time nominal high of $1,923 in August 2011, just days after a deal in Congress…” The passage was revised to read “all-time nominal high of $1,923 in September 2011, not long after a deal in Congress…” Our thanks to Dwight for this correction. Thanks as always, Dusty, my friend. Next question iis will Trump make silver great again? Well researched article. Sadly, gold is likely to rise, but not for the reasons you suggested. The fledgling and incompetent Trump admistration will be leaving soon for reasons including, but not limited to Trump’s financial ties to Russia. When he leaves, the current stock bubble will burst, leaving stockholders at a loss.Many wise investors are already moving assets into precious metals and mining stocks. Not only gold will rebound, but especially undervalued platinum.Take a look at how the economy fared when the price of gold last exceeded that of platinum for a sustained period. @1958- I think so. Silver has been doing better than gold in percentage terms this year (though both metals took a dive yesterday). Plus gold and silver typically rally at the same time. @Dwight- Thanks for the correction.